Waikoloa Beach Resort's newest oceanfront resort offers luxuriously appointed condominiums and townhomes along Waikoloa's Beach Golf Course and stretching to the Pacific Ocean. Relax by the cascading oceanfront pool or explore the numerous shops and restaurants at the nearby King's Shops and Queen's Marketplace. Two-and three-bedroom condos and townhomes have full gourmet kitchen, washer/dryer, premium bedding, flat panel TV/cable, and CD/DVD player. 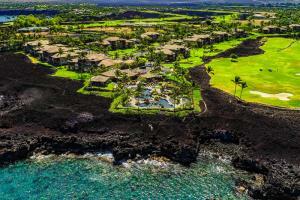 Located only 18 miles from the Kona International Airport.